Marques, C. N. and Craver, S. A. (2015). Quantification of Respiratory Activity in Biofilms. Bio-protocol 5(18): e1591. DOI: 10.21769/BioProtoc.1591. Bacteria live mostly as biofilms, not as planktonic cell populations. Bacterial cells living as biofilms are known to be in different physiological status. Persister cells are one of such physiological conditions and they are recognized as to be a stochastically produced sub-population of non-growing bacterial cells. The following protocol describes a method to determine the respiratory activity of cells within biofilms. The procedure below, describes how to assess the respiratory activity of persister cells present within biofilms. However, the method can be adapted to overall biofilm populations. In this method, differential staining is used where respiratory activity (metabolic activity is assessed) using the monotetrazolium redox dye 5-cyano-2, 3-ditolyl tetrazolium chloride (CTC) that produces a fluorescent formazan (CTF, indicated by cells stained in red) when reduced. All cells are stained with the nucleic acid stain SYTO 40. Biofilm development in flow cell reactors. Prepare a streak plate on LB agar of a frozen stock of the bacteria of interest (in this case Pseudomonas aeruginosa PA14) and incubate under static conditions at 37 °C, for 24 h.
Remove 2 colonies from the streak plate and inoculate a broth culture of 5 ml LB broth. Incubate at 37 °C with agitation (220 rpm) for a period of 12-24 h.
Dilute the overnight culture to 1% in 50 ml of fresh LB medium in an Erlenmeyer flask. Measure the OD600 of the overnight culture and standardize the culture to have an OD600 of 0.8 in 10 ml of LB. Aspirate the culture with a 10 ml syringe with a needle and then cap the needle. Inoculate each flow cell reactor. 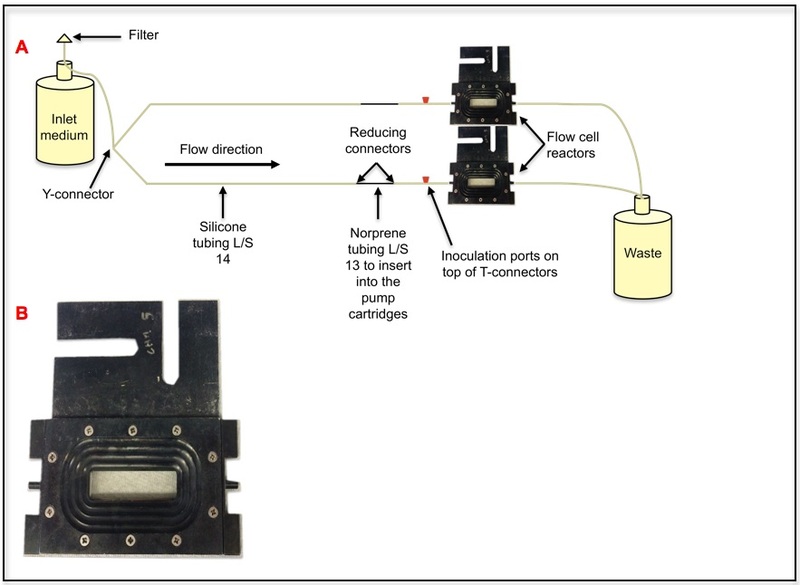 In this example, biofilms were cultured in flow cell reactors (Figure 1), as described previously (Sauer et al., 2002; Davies and Marques, 2009; Marques et al., 2014). Each flow cell reactor was inoculated with 3 ml of a standardized overnight culture (OD600 of 0.8) and incubated, under static conditions, for a period of 1 h, to facilitate cell attachment. Figure 1. Flow cell reactor system. This is a once through continuous culture system. Once the bacterial culture is inoculated into the inoculation port, biofilms develop on the coverslip of the flow cell reactor. Only the bottom reactor is labeled, the top reactor is set in an identical manner. One of the flow cell reactor sets is labeled. A. Schematic version of a flow cell system where 2 flow cells are run together. B. Flow cell reactor. Following 1 h incubation at room temperature - to allow the bacteria to attach to the coverslip (this time can vary, depending on the bacterial strain) - initiate the flow. Allow biofilms to develop for a period of 6 days at room temperature (time and temperature may vary, depending on bacterial species used). At day 6 expose the P. aeruginosa PA14 biofilms to ciprofloxacin (150 x MIC) or saline (control) for a period of 18 h.
Note: When assessing overall mature biofilm populations, not persister cell populations, at day 6 perform step 12. Respiratory activity can also be assessed at different days, during biofilm development. Expose the remaining biofilms to saline containing SYTO 40 (5 μM) and CTC (5 mM), for a period of 60 min. CTC has previously been used to determine the respiratory activity of bacteria within biofilms (Schaule et al., 1993). When attempting to determine the effects of certain compounds on persister cell activity, perform this step for 30 min only. The treatment to be performed should be initiated following this step. CTC: ex 476, em 650-680. If performing step 12a, then following 30 min, expose the biofilm population to saline or the testing agent, together with SYTO 40 (5 μM) and CTC (5 mM) for further 60 min. Quantify relative fluorescence with the program Intensity Luminance V1 software. This program determines the relative fluorescence present on the images by quantifying the green, blue and red fluorescence. We have provided a link for the software, which contains the instructions of how to use it; we developed the program and made it available to other researchers as freeware. SYTO 40 (blue) will stain all cells while CTC stain (red) will stain only respiratory active cells. Thus, 100% of the cells will stain blue, making it possible to determine which percentage of the population is undergoing respiratory activity (red cells) during a 60 min period. If steps 12a and 13c were performed then, the results obtained for the initial 30 min should be used as baseline. In the case of persister cells, the difference between persister cells and overall population would be assessed. Perform quantitative analysis of biofilms using the COMSTAT software (Heydorn et al., 2000). A newer version of the COMSTAT software is now available, and has a plugin to enable its use with ImageJ. This program is widely used by biofilm researchers to determine and quantify: total biofilm biomass, biofilm cluster thickness, portion of slice occupied by the bacteria, surface area of biomass and surface to biovolume ratio. Blue channel (total) and red channel (respiratory active) images can be analyzed, and differences in respiratory activity between controls and treatments can be performed. In the case of persister cells, the difference between persister cells and overall population would be assessed. To assess the respiratory activity, compare between total cells (SYTO 40) and CTC stained cells (respiratory active cells). Repeat the experiment 3-4 times to ensure reproducible data and to allow for calculation of whether the results obtained are statistical significant when comparing controls to treated samples using ANOVA, followed by the Tukey’s comparison test. Our laboratory has made use of this type of assay to assess whether the fatty acid signaling molecule cis-2-decenoic acid (cis-DA) would increase the respiratory activity of P. aeruginosa persister cells present in biofilms (Marques et al., 2014). Biofilms were cultured as described in the procedure above, followed by exposure to ciprofloxacin (150 mg/L) for a period of 24 h. Subsequently, the remaining biofilm population, consisting of solely persister cells, was exposed to saline containing SYTO 40 and CTC for a period of 30 min (to obtain a baseline for the stain measurements) followed by a 1 h exposure to either saline or cis-DA (100 nM) in saline. Biofilms were visualized by confocal scanning laser microscopy (Leica Confocal TCS SP5 Imaging System with a DMI 6000 inverted microscope) using the parameters described in the procedure above. Images were acquired with the Leica LAS AF software. 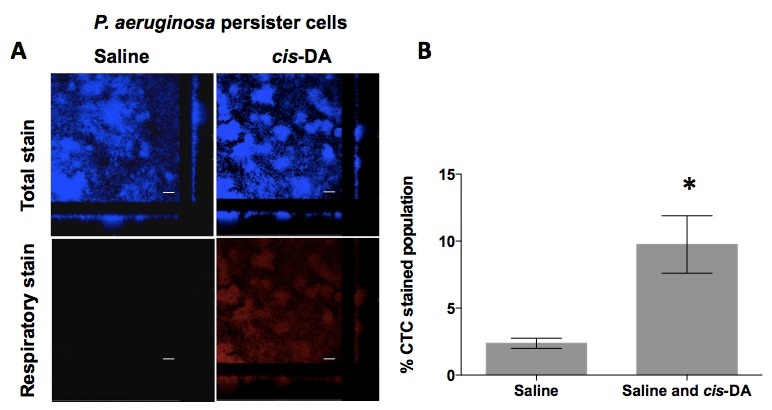 In the presence of cis-DA, a significant increase of CTC stain (red panel) was observed compared to exposure to saline alone (Figure 2A) consisting of a 10% increase (P<0.0001). We also observed that persister cells display a respiratory activity, which is indicative of an active metabolic status, albeit being 2.5% (Figure 2B), a low level not visually observed (Figure 2A). Images of background measurements, using confocal microscopy, should be acquired 25 min following the initial exposure of biofilms to CTC and SYTO 40. Second exposure of to CTC and SYTO 40 should only be initiated once all the background images were acquired. The respiratory activity assay using CTC and SYTO 40 is a modification of previously published protocols (Schaule et al., 1993). COMSTAT analysis is based on previously published software (Heydorn et al., 2000). This work was supported by SUNY structural funds. Heydorn, A., Nielsen, A. T., Hentzer, M., Sternberg, C., Givskov, M., Ersboll, B. K. and Molin, S. (2000). Quantification of biofilm structures by the novel computer program COMSTAT. Microbiology 146: 2395-2407. Schaule, G., Flemming, H. C. and Ridgway, H. F. (1993). Use of 5-cyano-2,3-ditolyl tetrazolium chloride for quantifying planktonic and sessile respiring bacteria in drinking water. Appl Environ Microbiol 59(11): 3850-3857. How to cite: Marques, C. N. and Craver, S. A. (2015). Quantification of Respiratory Activity in Biofilms. Bio-protocol 5(18): e1591. DOI: 10.21769/BioProtoc.1591. These references are extremely useful to me because I am preparing my paper about biofilms. I have no idea that there has saline in it. Maybe I have to look for related information to widen my horizon. Informative article.